Just a few weeks ago, Adam and I took a small stay cation here in Phoenix (like we love to do) and I always enjoy taking a few candid photos to remember our stay. 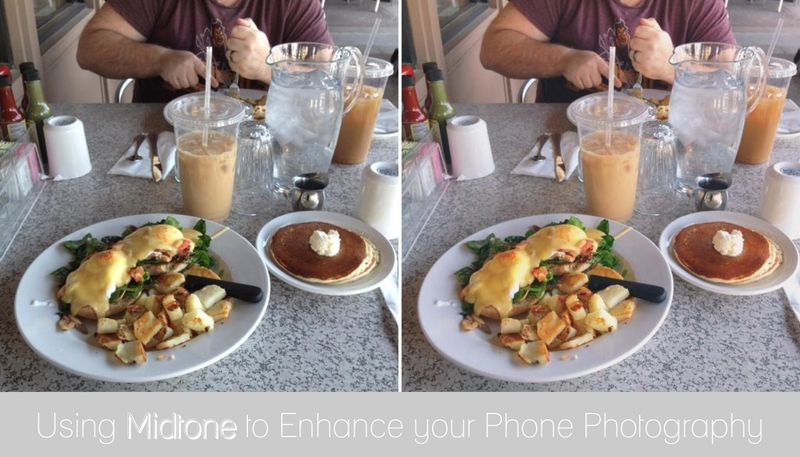 In this photo, we had an AMAZING breakfast at The Good Egg in Scottsdale, and their Florentine Egg's Benedict looked fabulous--just had to snap a pic! But my iPhone photos are just OK--that is why I like to use apps like Afterlight, PicTapGo, VSCOcam, Mixtures, Big Lens, and even Snap Pen to enhance them. For this photo I edited today, I solely used Afterlight. The midtones of an image show the "colors in-between" if you will. One way to look at this is this: if you have a black and white photo and there is something that doesn't fit into that mold, what color is it? Answer: it's grey. But the bigger answer is that it is a midtone. These are the colors that really make a photo stand out, and add in the contrast to make an all-around professional looking image. If you look at the diptych at the top of this blog post: the photo on the left is the original, and as you can see it was early morning in the shade (i.e. not a lot of light, but enough light to take a focused photo with a lower resolution camera). I can work with this! On the right is the finished photo--enhancing the atmosphere around the photograph so that is melds well, but enhanced just enough to really make a huge impact and a great difference of quality. Red midtone adds warmth, and enhances anything in the red/yellow/orange category. Blue midtone adds a cooler layer over everything, and as you can see with this image it gives it the effect that it's cold outside or even really early in the morning. Green midtone gives a retro effect in this image, almost as if I were taking the photo with an older, disposable camera. Editing green midtone is great for nature photography and lots of greens! As you can see, these are the exaggerated mid tone effects on these images. But above you will notice there is a slider, which you can pull back and forth to experiment with. For the final photo in the diptych above, I increased the red midtone about half way to the marker. Saved it. And then added 1/4 green as well. I also upped the contrast a small amount, and also sharpened it a bit. I challenge you to leave pre-made filters behind you, and invest maybe $1-$2 on a real, photo editing app for your phone. Remember, if you buy it for your iPhone you can always redownload it on another compatible iOS device in the future with the same account (directions here). This is very cool. I need to utilize these features more. You totally should! And with some of the new iOS 8 updates that were released at the WWDC today, there will be even better ways to enhance photos right on an iPhone/iPad in the Photos app! I am always looking for ways to enhance my photos. Thanks for the tips! Heading to the app store now to get this. I totally need this in my life thank you for sharing. Sweet! You won't regret getting Afterlight. This is interesting...I need to learn how to best use my phone and digital cameras better; there are so many different features that I am not taking advantage of. Totally! You should--I realize it can be overwhelming, but typically once you have learned it everything becomes much simpler. Interesting. I am always looking for ways to make my photos more eyecatching. This is fantastic, thanks for sharing this. I had no idea! My pleasure & thanks for having me! Cheers!